I believe that this is the house that the stork delivered my mother too in Yellowknife, NWT. She was born in the summer - so there was a little less snow, but you get the idea. 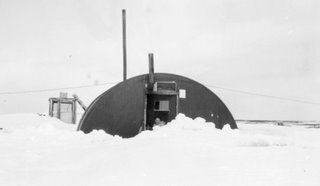 I found a website with a number of current and historic Quonset Hut photo's. My most recent experience in a Quonset hut (acutally that should probably read only) was actually in Fredericton, NB at Master Dave Murrey's Tai Kwon Do Club. It worked well for a martial arts studio - I could see it working for a home. Last year, I was all excited by geodesic dome houses and their many excellent qualities - that said - furniture is easier to fit into a square house and a square house is easier to sell if one plans on moving over their lifetime. I'm sure that I can obtain some excellent stories from my Grandparents about this house. For now, I'll dispell the myth that my mother's first bed was a drawer. While I personally think that this is a practical solution in the north where it takes months to order furniture at times and costs a small fortune in shipping, the truth in this myth is that once in a hotel a drawer bed was improvised for my mother when she was an infant - she did indeed have her own crib in Yellowknife and the drawer was a temporary solution while travelling.